Modern farm tractors usually have five foot-pedals for the operator on the floor of the tractor. The pedal on the left is the clutch. 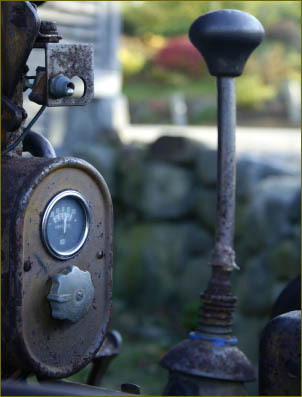 The operator presses on this pedal to disengage the transmission for either shifting gears or stopping the tractor. Two of the pedals on the right are the brakes. The left brake pedal stops the left rear wheel and the right brake pedal does the same with the right side. This independent left and right wheel braking augments the steering of the tractor when only the two rear wheels are driven. This is usually done when it is necessary to make a tight turn. The split brake pedal is also used in mud or soft dirt to control a tire that spins due to loss of traction. The operator presses both pedals together to stop the tractor. For tractors with additional front-wheel drive, this operation often engages the 4-wheel locking differential to help stop the tractor when travelling at road speeds. The pedal furthest to the right is the foot throttle. Unlike in automobiles, when operating tractors, the throttle can also be controlled from a hand-operated lever ("hand throttle"). This helps provide a constant speed in field work. It also helps provide continuous power for stationary tractors that are operating an implement by shaft or belt. The foot throttle gives the operator more automobile-like control over the speed of the tractor for road work. This is a feature of more recent tractors; older tractors often did not have this feature. In the UK it is mandatory to use the foot pedal to control engine speed while travelling on the road. Some tractors, especially those designed for row-crop work, have a 'de-accelerator' pedal, which operates in the reverse fashion to an automobile throttle, in that the pedal is pushed down to slow the engine. This is to allow fine control over the speed of the tractor when manoeuvring at the end of crop rows in fields- the operating speed of the engine is set using the hand throttle, and if the operator wishes to slow the tractor to turn, he simply has to press the pedal, turn and release it once the turn is completed, rather than having to alter the setting of the hand throttle twice during the maneuver.